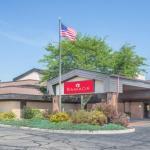 Guests will find complimentary breakfast an indoor pool waterpark and fitness center at the non-smoking Ramada Waupaca a block from Route 10. Housed in a three-story brick building the 90 rooms at the non-smoking Ramada come with an LCD TV and Wi-Fi. The indoor pool and hot tub also feature an indoor waterpark for guests. Work out at the large fitness center which sports several kinds of strength and cardio equipment. Other amenities include an on-site lounge free continental breakfast and a business services. Parking is available. Pets are welcome. The Ramada is a block from Route 10 across the street from a restaurant and less than two miles from the heart of Waupaca. Drive a mile to the Waupaca Woods Shopping Mall or three miles to River Ridge Trail. It's 40 miles to Outagamie County Regional Airport and 56 miles to Austin Straubel International Airport.